This trial is also known as the The State of Tennessee v. John Thomas Scopes and the Scopes Monkey Trial. This was an American legal case in which John Scopes, a high school instructor, was found violating the TN Butler Act. This act made it illegal to teach the evolution of humans in any state-funded academy. Once he was found guilty, the trail was purposefully set up in order to attract publicity to the small town of Dayton, Tennessee where it was held. In reality, Scopes was truly unsure whether or not he had ever actually taught evolution in this manner, but he purposely incriminated himself so that the case could have a defendant. Scopes was found guilty and fined, but the verdict was overturned on a technicality. 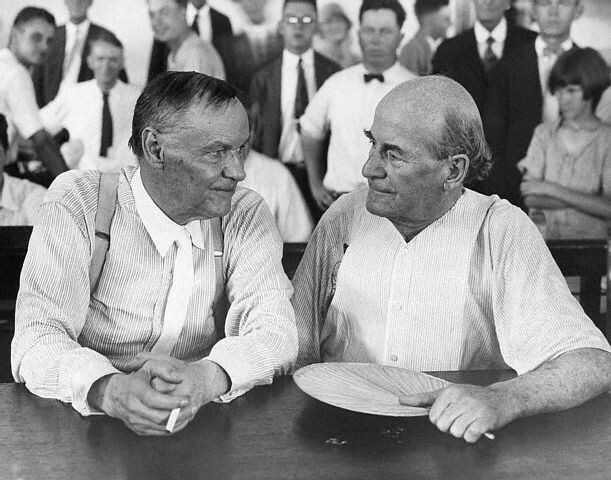 William Jennings Bryan, three-time presidential candidate, argued for the prosecution, while Clarence Darrow, a famous defense attorney, spoke for Scopes. This was the Fundamentalist-Modernist Controversy. In doing so, Modernists, who said evolution was not inconsistent with religion, was set against the Fundamentalists, who said the word of God as revealed in the Bible took priority over all human knowledge. This was extremely important as this was the first time a controversy had arisen between religion and law. In this case, it was on the subject of evolution and two major groups in the United States had differing opinions. The Modernists believed in a more advanced, scientific, newly discovering world; however, the Fundamentalists were set on the idea that whatever the Bible stated was the truth. Although Scopes did end up getting the guilty verdict and having to pay a 100$ fine, the sparked a new controversy in the history of the United States over religion or law.